The Wildlife Trusts share a vision for a Living Landscape across the UK where the environment is richer in wildlife for everyone. This vision translates into Gwent Wildlife Trust’s mission to achieve this for all who live in Gwent, which covers the unitary authorities of Monmouthshire County, Torfaen County Borough, Blaenau Gwent County Borough, Caerphilly County Borough to the east of River Rhymney, and Newport City. 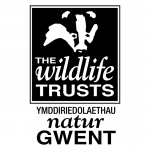 GWT is a registered charity with over 10,000 members, and is a leading local force for wildlife with nearly 50 years of working to promote and conserve Gwent’s wildlife. GWT has more than 200 active volunteers, employs 23 staff, and works towards a vision of an environment rich in wildlife for everyone. GWT manages 30 nature reserves for people and wildlife, runs a far-reaching community education programme, stands up for threatened wildlife and works closely with schools, local landowners and community groups. It works in partnership with many voluntary and statutory organisations and is a member of the UK-wide partnership of 47 independent Wildlife Trusts, as well as working closely with the five other Wildlife Trusts in Wales.